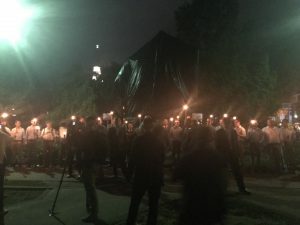 White nationalist Richard Spencer just led another torchlit rally at Emancipation Park in Charlottesville. Spencer, who is one of the most recognizable faces of the alt-right and white nationalist movement held a similar rally in May to protest the removal of a statue glorifying Confederate General Robert E. Lee. According to posts being circulated on Twitter and Facebook, around two dozen young white men gathered at the feet of the statue which remains shrouded due to events surrounding Unite the Right in August. Unite the Right was the largest gathering of white nationalists and supremacists in decades, which left one counter-protestor dead in a domestic terror attack. Spencer’s group was recorded chanting, “You will not replace us”. This was the same chant used by white nationalists and supremacist who stormed University of Virginia’s campus in another torchlit procession the Friday before Unite the Right this past August. 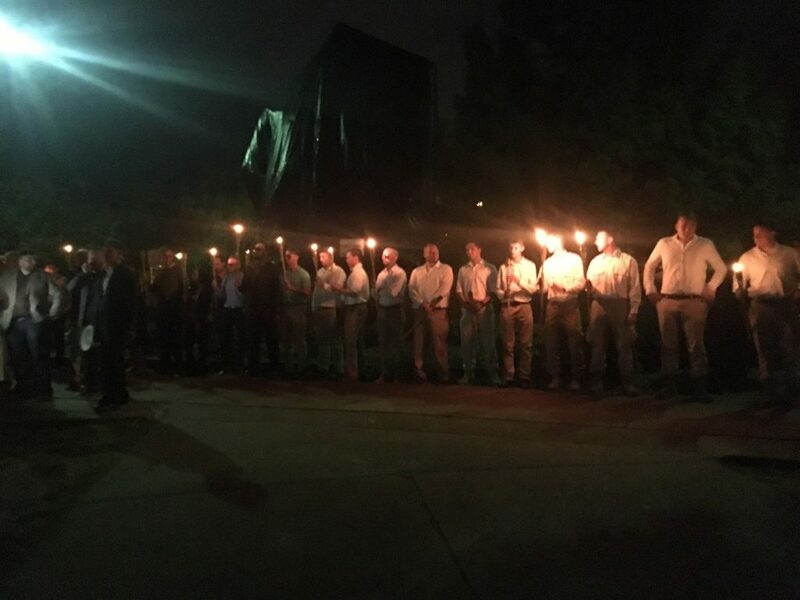 Torchlit rallies have become a signature hallmark of these groups, and is a visible symbol meant to intimidate and threaten those who do not support their supremacist ideology. In another video of the incident retweeted by Spencer, he can be seen speaking to the crowd saying, “We are here to represent white America’s interests.” He eventually finishing by saying, “The left wing establishment is built around anti-white policies and anti-white rhetoric…we are a people with interests and we are a people who will not be replaced.” The group of white supremacists was also apparently recorded chanting, “the south will rise again” and “Russia is our friend”. According to information circulating on social media, Spencer and his cohort left about 45 minutes after showing up on the scene. No arrests or injuries have been reported.